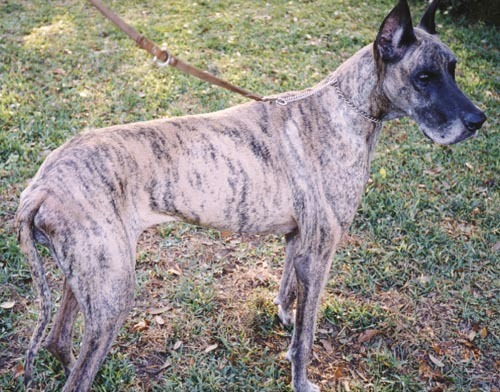 Great Dane Rescue of Tampa Bay Inc - Molly is a ten year old Brindle female. Molly is a 10-year-old Brindle female. Her human parents recently passed away leaving Molly alone. She is a very sweet dog that loves to sleep on the couch and eat ice cream! She acts like she is 7 years old. She has been through obedience school and passed with flying colors! She knows her name, come, sit, down, no, go outside, go potty, go to bed and stay. She is fine with other dogs and cats but she prefers to be an only child.